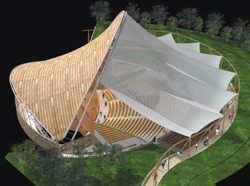 Image courtesy of FTL Design Engineering Studio An aerial view rendering of the proposed Music Pavilion at the Sun Valley Resort shows the permanent horn-like acoustic shell. A tent-like cover will shield the seating area. Teflon is the intended material, but that could change before the project is completed.